Powers/Abilities: Chapel is a trained assassin and is well-versed in the arts of guerilla warfare. He has augmented strength and ability from the injections he took while still a part of the CIA and is proficient in the use of a number of different hand-to-hand and ranged weapons. His weapon of choice is a specially modified machine gun equipped with a built in 40mm grenade launcher. He also employs a special hyper-cycle as a mode of transportation that is outfitted with a number of different weapons, including a self-contained missile rack. With his berserker rage and his ghoulish outlook, he is sometimes viewed as a mindless killing machine, but Chapel is highly intelligent and has a keen sense of perception. History: A renowned womanizer and ruthless killer, Bruce Stinson began his career as a member of the CIA's elite death squad, Operation: Knightstrike. While involved with Knightstrike, Chapel willingly underwent a series of chemical injections intended to heighten his physical abilities. Unknown to Stinson at the time, however, these injections were a means of controlling potentially dangerous "rogue" agents and the injections were laced with a special strain of the HIV virus which could be activated on command. Despite his fierce temper, Chapel served the CIA faithfully during his tenure with Operation: Knightstrike. Following orders from director Jason Wynn, Chapel looked on as his friend and partner Al Simmons murdered another agent, code named Duke, during an assault on Cybernet and later (also at Wynn's behest) assassinated Simmons during an assault in Botswana. Following his departure from the CIA, Chapel joined the Youngblood organization. Some time later, Wynn contacted Chapel, requesting that he perform another operation for the CIA, but Chapel refused. Wynn then informed Chapel of the true nature of the injections he had been given., promptly notifying the Youngblood organization of Chapel's HIV status as well. 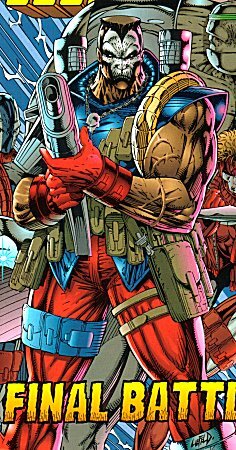 His blatant promiscuity precluded any possibility of public acceptance for his condition and he was removed from the public eye as a member of Youngblood and shuffled aside to lead Bloodstrike until the original members were destroyed by Quantum. Chapel's current whereabouts are unknown.